GoodGuide, the startup that rates consumer products by factors including the toxicity of their ingredients and environmental impact, has released its native iPhone application on Apple’s App Store. 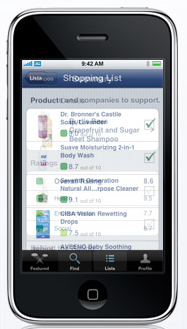 The free application allows users to browse and search through the site’s rapidly growing database (now with around 60,000 products) using either a product’s name or UPC code, and can be found here. GoodGuide was a favorite at this year’s TechCrunch50 conference, generally regarded as a great idea and eventually finishing as a runner up for the event’s top prize. The site’s database rates each consumer product based on its health, environmental, and social performance, pointing out things like carcinogenic ingredients and the manufacturer’s treatment of employees and the environment. Because shoppers don’t generally plan exactly which items they’re going to buy until they’re in the store, GoodGuide’s mobile functionality will play an important role in the startup’s success. Before now users could access a mobile version of the site through a web browser, but the iPhone’s native app is much speedier and more intuitive - I could see this becoming a favorite for the “soccer mom” demographic and the environmentally and health conscious. GoodGuide also plans to have an Android version available within the next few months. My one major gripe with the app is that it always opens to a “featured products” page, forcing you to hit a few menu items before reaching the search box. I’d also like a way to photograph the barcode of a product and automatically look it up in the database, though I’m not sure the iPhone is even capable of this (there are only a few barcode apps on the iPhone, and it seems that most of them only support QR Codes. On Android, they rank among the most popular apps).